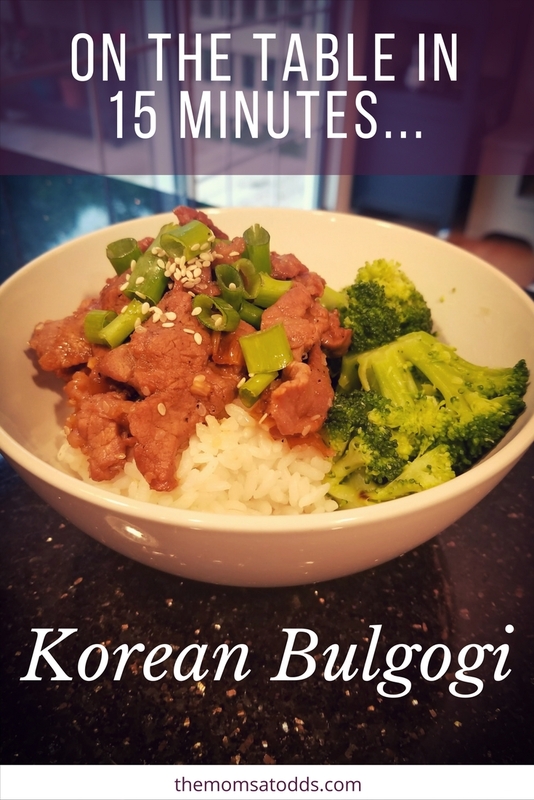 Korean Bulgogi… on the table in 15 min! One of my secrets to successfully managing life as a working mom is how I serve a home-cooked meal every night. Sometimes I don’t get home until 6:30, so it’s essential food is on the table quick! I have a whole arsenal of delicious recipes that can be prepared in less than 15 minutes on the night of serving. To achieve this, often prep is required the night before, but I get that done after the kids are in bed. 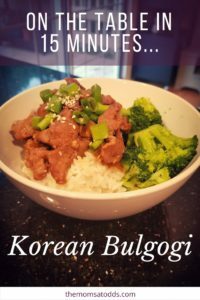 Korean bulgogi is one of my whole family’s faves, including my toddlers. I love it too because it takes very little night time prep and fires up in minutes. It’s an easy recipe, so don’t be intimidated if you’re a beginner cook. If you have the proper tools and follow a few of my tricks, it will be even simpler. Plus, this meal freezes great so whip up a double batch and save half for a day you don’t have time to prep the night before. Let me show you how! First off, let’s talk about the ingredients. 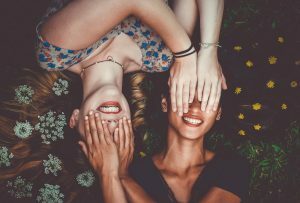 You have a wide variety of protein choices you can use. I prefer beef, and that’s definitely more traditional, too. Choose any steak that’s a reasonable price and one that you would eat as a steak (as opposed to one you would use it a stew). 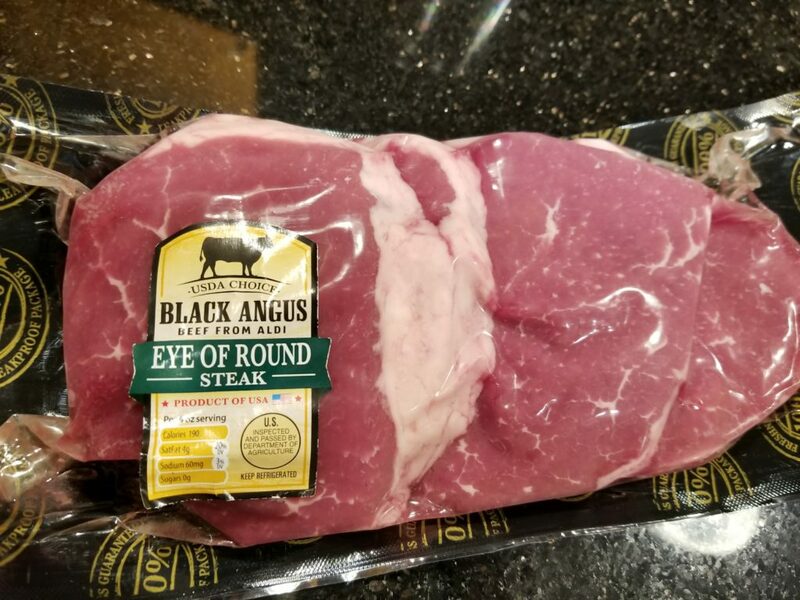 Something like flank steak works great, but personally I usually go for the eye of round steak from Aldi because at my store it’s only $4.99/lb. Or, if you prefer, you could even use chicken. Try to get as close to 1 pound as possible, or else you’ll have to mix up a little extra marinating liquid to ensure all the meat is flavored. Lastly, since there aren’t that many ingredients make sure you have everything available and try not to substitute (except for the garlic, I sub garlic powder some of the time and it works just fine). (Step 1) Prep the marinade – Get out a large, gallon-sized ziplock bag. If you’re doubling the recipe to freeze a portion, get out two. Put all the marinade ingredients in the bag, zip it up, and give it a good shake to mix everything up (again, do this twice if you’re making a double batch). After the marinade is prepared, prop open the bag on the counter. This is similar to the food processor I have, and so far it’s lasted 7 years and is still going strong. It came with all the different attachments I need and it’s the perfect size. Can you tell how much I love it? 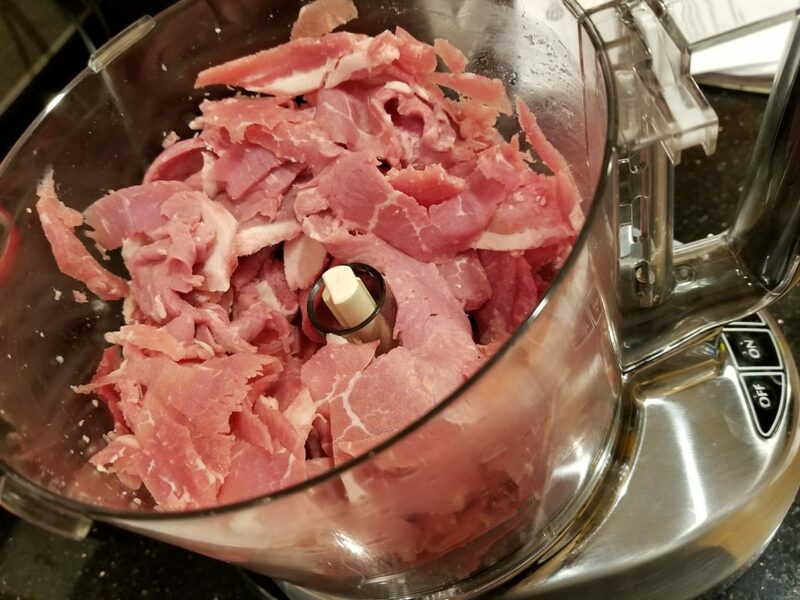 (Step 3) Add the meat to the marinade – Pick up the sliced meat from the food processor (or from the cutting board if you sliced it by hand) and put it in the ziplock. If you doubled everything, divide the meat into two portions and put it in the different bags. Put the bag you’re going to eat the next day into the fridge. For the second bag, label it and put in the freezer. (Step 4) Make the rice – One absolutely ESSENTIAL kitchen tool to have if you want little prep time is a rice cooker . You’ll want to look for one that keeps the rice fresh after cooking. Because of this, I make the rice the night before (or even the morning of) I’m planning on serving the meal. I usually make 2 cups worth and that will feed my family of 4 and still have leftovers. The rice cooker keeps it fresh so when dinner comes I just open it up and serve. I have this one and it’s great. It has functions for normal white rice, sushi rice, quick rice, brown rice, etc. It’s also supposed to steam, but I haven’t tried that yet. (Step 1) Cook veggies – So many options here, start up some oil/butter on the stove and add some green beans, start some frozen broccoli steaming in the microwave, or even take out some carrot sticks. (Step 2) Cook the meat – Get out a big saucepan and crank up the heat to medium-high. Add meat. Stir and heat until cooked through, and since the meat is sliced super thin it only takes a few minutes. (Step 3) Plate – While the meat is cooking take a second between stirs to start dividing up the rice between plates. Add veggies, then meat on top of the rice. *BAM* you’re done. The night before (or morning of), place ingredients for the marinade in a ziplock bag and shake it to stir. Slice steak very thin and add it to the marinade bag. When it’s time to cook, spray a large frying pan with cooking spray and heat to medium high. 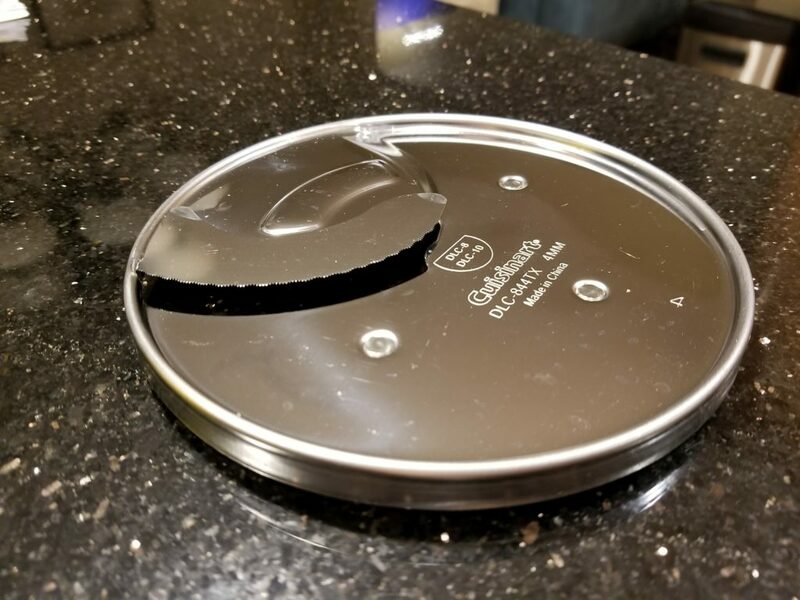 Once the pan is hot, empty the entire bag into the pan. It will cook fast, so keep stirring to make sure it doesn’t overcook. Serve over rice. Garnish with extra sesame seeds and/or green onions if desired.